Action: Choose a non-Ancient One character. 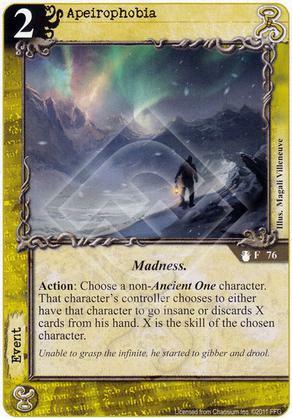 That character's controller chooses to either have that character to go insane or discards X cards from his hand. X is the skill of the chosen character. Unable to grasp the infinite, he started to gibber and drool. 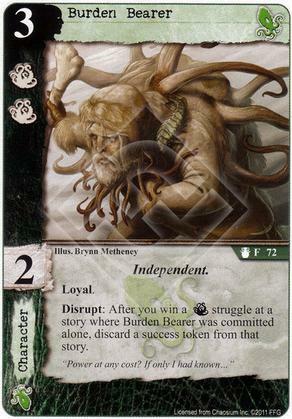 Disrupt: After you win a Terror struggle at a story where Burden Bearer was committed alone, discard a success token from that story. "Power at any cost? 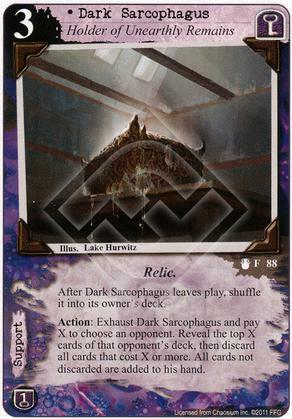 If only I had known..."
After Dark Sarcophagus leaves play, shuffle it into its owner's deck. 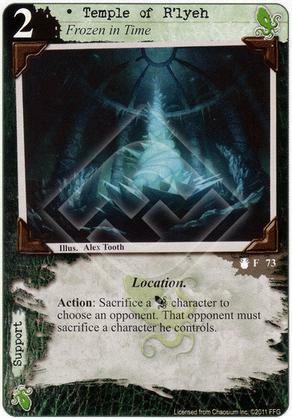 Action: Exhaust Dark Sarcophagus and pay X to choose an opponent. Reveal the top X cards of that opponent's deck, then discard all cards that cost X or more. All cards not discarded are added to his hand. 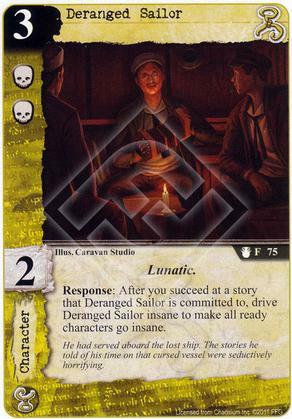 Response: After you succeed at a story that Deranged Sailor is committed to, drive Deranged Sailor insane to make all ready characters go insane. He had served aboard the lost ship. The stories he told of his time on that cursed vessel were seductively horrifying. Immune to Polar events. Toughness +2. 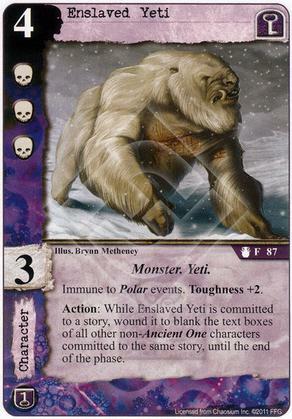 Action: While Enslaved Yeti is committed to a story, wound it to blank the text boxes of all other non-Ancient One characters committed to the same story, until the end of the phase. Action: Add an additional story struggle of your choice to 1 story until the end of the phase. 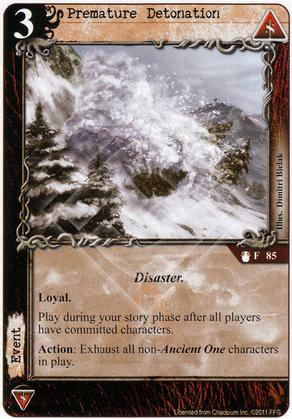 At the end of the phase, sacrifice attached character and shuffle Eon Chart into its owner's deck. Limit once per phase. 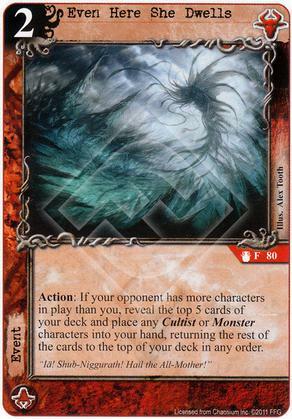 Action: If your opponent has more characters in play than you, reveal the top 5 cards of your deck and place any Cultist or Monster characters into your hand, returning the rest of the cards into to the top of your deck in any order. "Ia! Shub-Niggurath! Hail the All-Mother!" 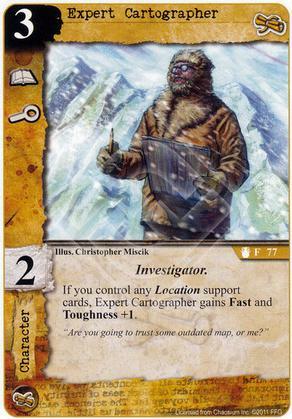 If you control any Location support cards, Expert Cartographer gains Fast and Toughness +1. "Are you going to trust some outdated map, or me?" 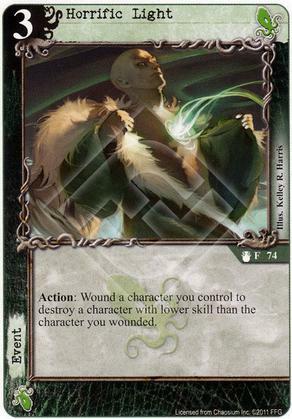 Action: Wound a character you control to destroy a character with lower skill than the character you wounded. 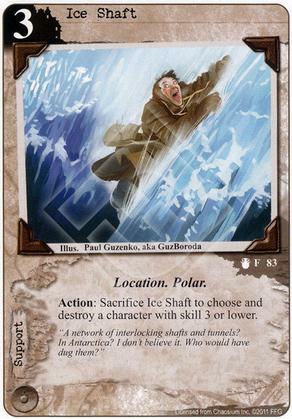 Action: Sacrifice Ice Shaft to choose and destroy a character with skill 3 or lower. "A network of interlocking shafts and tunnels? In Antartica? I don't believe it. Who would have dug them?" Forced Response: After a character you control is wounded, Jacques Artois gains (C)(I) until the end of the phase. He was connecting the dots, one dead body at a time. Action: Choose a non-Ancient One character committed to the same story as James Crusher. 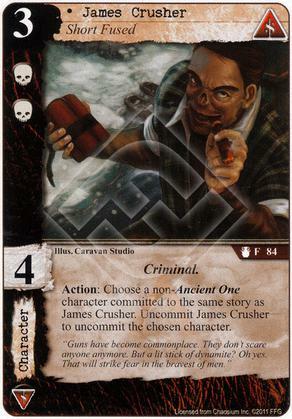 Uncommit James Crusher to uncommit the chosen character. "Guns have become commonplace. They don't scare anyone anymore. But a lit stick of dynamite? Oh yes. That will strike fear in the bravest of men." 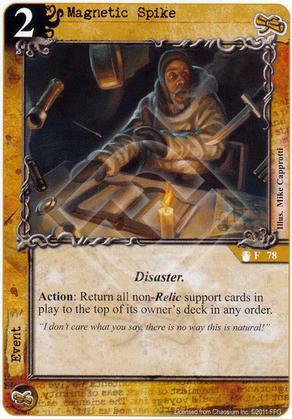 Action: Return all non-Relic support cards in play to the top of its owner's deck in any order. "I don't care what you say, there is no way this is natural!" Play during your story phase after all players have committed characters. Action: Exhaust all non-Ancient One characters in play. 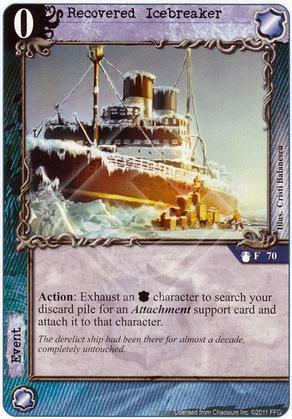 Action: Exhaust a [Agency] character to search your discard pile for an Attachment support card and attach it to that character. 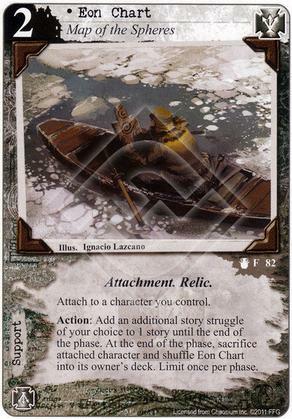 The derelict ship had been there for almost a decade, completely untouched. Action: Pay 1 to ready The Silent Mover. The creature's hatred for mankind was manifest in its every movement. 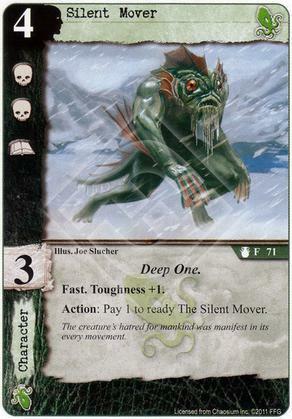 Action: Sacrifice a [Cthulhu] character to choose an opponent. That opponent must sacrifice a character he controls. Forced Response: After your opponent has committed characters, choose the story with the fewest committed characters, minimum of 1. 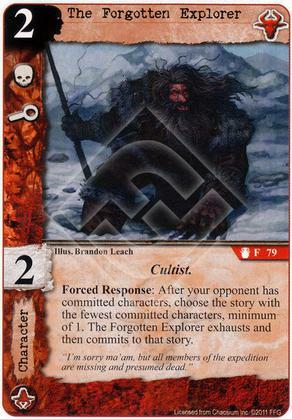 The Forgotten Explorer exhausts and then commits to that story. 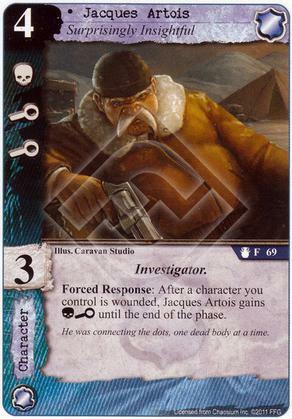 "I'm sorry ma'am, but all members of the expedition are missing and presumed dead." 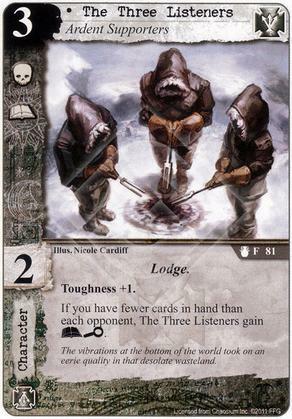 If you have fewer cards in hand than each opponent, The Three Listeners gain (A)(I). The vibrations at the bottom of the world took on an eerie quality in that desolate wasteland. 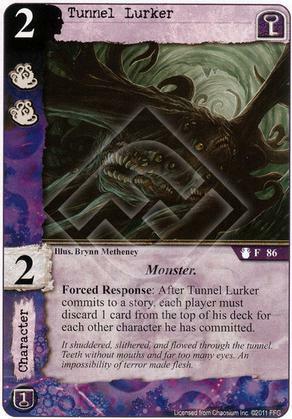 Forced Response: After Tunnel Lurker commits to a story, each player must discard 1 card from the top of his deck for each other character he has committed. It shuddered, slithered, and flowed through the tunnel. Teeth without mouths and far too many eyes. An impossibility of terror made flesh.